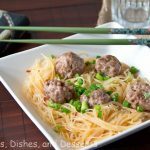 Slightly spicy rice noodles with Asian spiced meatballs. In a bowl mix together sausage, 5-spice, garlic and grated ginger. Mix until well combined. Shape into small 1 inch meatballs. Place on a baking sheet. Bake for 15-20 minutes, until cooked through. In a small bowl whisk together soy sauce, water, lime juice, brown sugar, fish sauce, chili garlic sauce, and olive oil. Pour into a small saucepan, and heat for a few minutes. Combine sauce with the rice noodles. Serve topped with a few meatballs, green onions and cilantro.